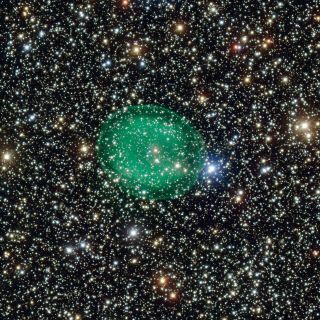 This photo shows the glowing green planetary nebula IC 1295 surrounding a dim and dying star. It is located about 3300 light-years away from Earth. The new image, released today (April 10) by the European Southern Observatory, shows the planetary nebula IC 1295 like it has never been seen before. This picture, which ESO scientists dubbed "ghostly," marks the first time the nebula has been imaged such unprecedented detail.